Punctuation and names have been normalized. Her strikethroughs have been retained. "Peking" is retained although the modern transliteration is "Beijing." 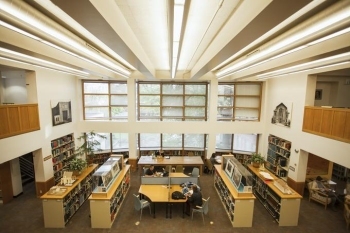 Where individuals have been identified, further information is provided in a footnote. China's might, territory and economy had been steadily eroded by foreign intervention, internal upheaval, and military defeats. The Manchu emperors had been deposed in 1911. The Republic of China, established by Sun Yat Sen, had been ceded to Yuan Shih-kai, who in 1913 quashed political progress in favor of creating a personal empire from Beijing. On Yuan's death in 1916, a series of warlords held Beijing. Sun Yat Sen had established a new political body, the Nationalist Kuomintang, and was beginning to consolidate Southern China, with the assistance of the Chinese Communists and the USSR. Chiang Kai-shek was building Sun's army. Tsao Kun[?] and Tuan Chi-Jui[?] held Beijing in 1924 as nominal president of the Republic, defended by Marshall Wu and his subordinate, General Feng. Chang Tso-lin, the marshall of Manchuria, was working with Sun to defeat the Beijing government. I have written you how difficult it was for us to reach Peking from Tientsin because Chang Tso-lin was moving his army and his supplies-getting ready to attack the government. Right: The fortified wall surrounding the Legation Quarter in Peking. Photo by Gertrude Bass Warner, 1924. PH014-045-38. We were overjoyed to find room at the Hotel des Wagons Lit because it is in the Legation Quarter, and just across the street is one of the entrances to our American Legation-so we could always give the flag just inside the entrance a silent greeting. While Chang Tso-lin was preparing to attack the government forces, with the object of moving onto Peking, General Feng, the Christian general, was given the task of blocking him. We reached Peking in the midst of the preparations-automobiles, horses, mules, carts- everything in sight was commandeered, including the men who drove them. Our rickshaw coolies requested American flags to place on our rickshaws to protect them and us. Every foreigner flew his flag on anything and everything that belonged to him, as a warning to the recruiting officers to keep their hands off. Left: Gertrude Bass Warner in a rickshaw. Photographer and date unknown. PH014-90-43. General Munthe's guards, the Chinese protection for the Legation Quarter, patrolled the southern quarter of the city in groups of five. When General Feng's army left, there was a sigh of relief. But about this time the Chinese merchants began to consider what should happen if General Feng's army should be defeated, and chests, trunks, boxes, baskets, chests of drawers-every conceivable kind of a receptacle, was filled with merchandise and taken to the sheltering wings of some foreign friend, in the Legation Quarter. Simultaneously the Chinese began to send their women and children to our hotel for refuge. Then, two weeks ago, on Nov. 6th, as I sat in the lobby of our hotel, waiting for Mrs. White-the Princess der Ling-John Dr. Ferguson came in. "Where are you going?" "On an errand outside the city wall with Mrs. White." "Don't you go. The city was captured last night by Feng's troops. Railroads, telegraph and telephone have been stopped-and the city is guarded in sections so no one shall get away." "But General Feng?" I asked. "He has joined forces with Chang Tso-lin. Stay in the Legation Quarter." He waited until I had promised. Right: Chang Tso-lin (18731928), the Old Marshall, was a Chinese general who fought in Manchuria against the Japanese in the Russo-Japanese war (1904-1905). Gertrude first traveled to Asia with her brother, John Foster Bass, a noted war correspondent who was covering the conflict. Chang controlled Manchuria from 1918-28, and fought for control of Peking with two other warlords, Feng and Wu P'ei-fu (18741939). In 1924 he began working with Sun Yat Sen to overthrow the Beijing government. Chang was assassinated by the Japanese for his determined defense of Manchuria, while retreating from the Northern Expedition to Mukden. His son, Chang Hsüeh-liang, took over Manchuria and was known as the Young Marshall. Keystone View Co., undated. PH014-40-42. We, as well as the Chinese, were considering the possibility of Chang Tso-lin's soldiers looting the city and were starting to gather in our Museum things. Mrs. White and I were going [to] a Chinese tailor's, in the Chinese city, outside the walls of the Manchu, or Imperial city, where I had left an Imperial coat, brought from my collection at home, to be made up. In the case of looting, everything, including that coat, would be lost. Mrs. White felt that she, a Manchu princess, would go where she liked, and started in her car. She went a block, as far as the city gate, and was turned back. We were quite short of funds, and not knowing what might be ahead of us, I went to the International Bank-located in the Legation Quarter-for money. The Chinese, fearing that the government paper money might become invalid, were making a run on all the banks, demanding silver in the place of their paper money. The Chinese bankers promptly closed their doors. In the enclosed section set aside for their Chinese depositors in the International Bank, there was a seething mass of people, all calling at once to attract the attention of the clerks and get their paper money changed to silver. The young woman who waited on me said they would not have to close their doors, as they had millions in their vaults. In the meantime, Mrs. Seaton and Mrs. Potter had taken the bit in their teeth and gone in another direction for the porcelain that I had left with the dealer to be packed. Two trips brought them all back to our hotel. The Legation Quarter is the safest part of the city. It is guarded from the inside by the Marines from all the legations and from without-so we thought-by Gen. Munthe's troops. But no, when the city was captured the Chinese guards were incarcerated and only allowed to go out one at a time swearing allegiance to their captors. General Feng said he would maintain order and there should be no looting. Two would-be looters were promptly decapitated and their heads, each in his box, was exposed at the city gate as a warning. Right: General Feng's army, preparing to defend Beijing. Gertrude Bass Warner. PH014-40-45. The "Fengian army" was a faction of the Beiyang Army, an important military body that served the Beijing government. It grew out of the early rebellion against the Manchu empires, and was based on personal loyalty rather than institution. Control of this army gave Yuan Shih-kai the power to take over the early Republic, and kept the succeeding warlords in power in Beijing until 1928. The city was hermetically sealed-No one could go in or out of the city on that day. No trains, no telegraph, no telephone, no mail-it was hermetically sealed except for one means of communication. The American Legation has a wireless and sent word of our plight to the world. The President of the Republic was locked under guard in his palace. One official was locked in the cellar of General Feng's house, awaiting being held for a ransom. The rest of the officials of the old government came into the Legation Quarter, where they were by treaty immune. They flocked into the Hotel des Wagons Lits until every available nook and corner was taken. Some of them came down to the dining room for their meals but most of them, considering discretion the better part of valor, staid [sic] in hiding in their rooms. The halls and stairs were crowded with Chinese children, as many girls as boys, I was happy to see. When, in Tokyo, we talked over the pros and cons of coming to Peking with J. Ballantine, our Vice-Consul, he said it would be safe to go to Peking, because it would always be possible to get away. According to our treaty the railroad between the capital and the sea must be kept open. The diplomatic body was called together. The nationals from each country were carefully listed. There were 1,300 Americans who might have to be taken into our Legation if the government side should say to General Feng, "No you don't," and there should be a fight on within the city. After a few days an "International train" was sent up from Tientsin, with 200 guards, mail, and reinforcements of soldiers for the legations. The train arrived at eight o'clock at night and started back two hours later. Draped over the front of the engine was "Old Glory," and on the sides the English, French, and Japanese flags. French, and Japanese flags. The train reached Tientsin safely. Twice once more the train it came up and returned at night. The second time, we thought that we would go on the 2nd trip. John Dr. Ferguson was opposed. He said, "You may get there and then again you may be turned back. There is fighting all along the track. If you are turned back you will have lost your places in this hotel in the Legation Quarter. We could take you in, but how about Mrs. Seaton and Mrs. Potter?" General Feng is in league with Soviet Russia. The Soviet government had established itself, not in a legation like the other foreign powers, but in an Embassy, in the Legation Quarter. An ambassador has precedence over a minister, and the situation is full of possibilities. The government's party did say "No, you don't," to General Feng, and Marshall Wu's army was started for Peking. Once more General Feng left the city, this time to fight his old chief. We watched the soldiers as they marched out thro the city gate. They were singing our hymns. At this juncture the Belgian Minister was ordered transferred to another post. The International Train was again sent from Peking Tientsin to fetch him, his wife, and their belongings as far as Tientsin. We decided that pressure would be brought to get that train thro, and we would go. It arrived Saturday night at 7:30 and left at 4 a.m. Sunday morning. To go on the International Train it was necessary to go to our Legation, armed with one's passports, each one personally making the request, so that Uiero [?] would should be able to question as to who went abroad. We were each given a permit to go on the train. The new government was very much on the alert to see that no members of the old government should get away in disguise. In order to make sure of our places we went aboard the night before, shortly after the train came in. Left: Gertrude's car on the International Train, evacuating foreigners, waiting on the tracks outside of Tientsin in 1924. Gertrude Bass Warner. PH014-33-44. There was a car for the Belgian Minister, and American car, two British cars, a dining car, a baggage car, and four cars for the guards, the French Capt. Bertrand in command. The cars were not heated. The temperature was considerably below freezing-we could see our breath. Our trunks being safely housed in the baggage car, we found Mrs. Boyd-Carpenter in the American car. She Her husband is professor of international law teaches in one of the universities in Peking. She and I occupied a compartment, while Mrs. Seaton and Mrs. Potter had a section in the open car. It was a 2nd class car, the seats covered with leather, without padding or springs, no sleeping accommodations. The French soldiers both from France and Amur [?] English, Tommies, Atkins, Johnnies, guns in hand, kept going back and forth all thro the night. It had been expected that Marshall Wu's forces would push Gen. Feng's closer and closer to the city until he would be forced to take refuge inside the city walls. Then when coal and food gave out, the city would surrender. We went very slowly, a detachment of engines ahead, with English marines aboard, look for bombs and derailed tracks. At 9 a.m., we came to the first trenches, three long zigzag trenches, some distance apart, running at right angles with our track. There was no sign of life in any of them. That meant that Feng's forces that left Peking to fight Marshall Wu were advancing, not retreating. We crept along. The country was absolutely deserted. At the little station, a few soldiers and a few camels carrying supplies. Suddenly, crack, crack, crack, crack-the advance engine was being fired upon, as a notice to stop. Some of the bullets flew past to our engine. A long wait, then a slow advance until fired upon again. The International Train was not expected and the soldiers did not know what to make of the foreign flags flying so carelessly independently over the engines. After a couple of these unpleasant experiences our engineer-Chinese-refused to run the get up from his prostrate position, and run the engine. One of our American officers took his place. A fusillade, a long stop. We were informed that there were sand bags on the track ahead. A request from us that they should be removed met the response that if we wished to go forward, we could go in to the firing line and remove them ourselves, which our soldiers eventually did. Feng's soldiers had red badges, with a white disk, on the left arm. Long lines of them marching with an encircling movement, in the same direction that we were going, made us think they were encircling Wu's forces. Finally we came to the outposts-instead of trenches, round holes, with a man or two in each. There was a sudden stop-a detached rail ahead-all hands got off to "look see." The English Johnnies Tommies hoisted it back into place very quickly. Finally we came to the outposts of Feng's forces, instead of trenches, round holes, with a man or two in each, just their heads and guns showing. The danger seemed over. The reconnoitering engine was switched off [to a different track] and we went on a little faster, much relieved. Not having slept the night before, I was indulging in a nap when suddenly roused by Mrs. Seaton Potter. "Gertrude, they are firing on us with a machine gun." Bum, bum, bum, bum-it seemed to last a long time but perhaps it was not more than a couple of minutes. We were ordered onto the floor by the French Commandant. It was Wu's men. There being no reconnoitering engine ahead of us, the gun was aimed at our engine, from the machine gun on the track ahead. The glass in the engine room was broken. The bullets whizzed past our coaches. We were near Tientsin. Wu Marshall Wu's men had made a quick retreat. Of course, they took us for the enemy. They apologized. Our train was unable to reach the city because of congested tracks. So we spent a second night on the train. Captain Bertrand, with a couple of aides, went for help. He feared that Gen. Feng's men would follow on the heels of Marshall Wu's retreating forces, and as one of our boys expressed it, "clean us up." Many of the soldiers left the train. The men passengers put their hand luggage on their seats, and walked the mile or so to the station. We would not leave our baggage, those precious Museum treasures, so the little group of six women and such of the guards as has stood by, spent the night in watchful waiting. The next morning Mrs. Seaton started on foot for the station, in search of a dray to carry our baggage. Mrs. Potter and I staid [sic] in on the train to be with it-I was going to say, to guard it. Before leaving Peking we had telegraphed to the Astor House Hotel at Tientsin for rooms. About an hour after Mrs. Seaton left, who should come along but the hotel porter and two assistants. The assistants got into the baggage cars to stay with our trunks until they could be taken out, while the porter took us to the automobile. At the Am.[??] office of the American Express Co. we found Mrs. Seaton. Right: Safe in Tientsin, Gertrude asks all the remaining British "Tommies" to pose by the locomotive, still flying the international flags to show that it was a foreign transport and not subject to Chinese law. Gertrude Bass Warner, Nov. 1924. PH014-33-43. Passing our engine on the way, I stopped to take another picture of it. Nearby were some British soldiers. I asked them to come close so that they would be included in the picture. All the British soldiers still guarding the train came. Having taken the picture and thanked them for their faithfulness and protection, we went on our way rejoicing. We had come the 80 miles in 31½ hours. Altho shells had passed above and beneath us, no one had been hurt. At the office of the American Express Co. we found Mrs. Seaton. She had reached the railway station just as Marshall Wu, with some 600 of his followers, were leaving by train for the coast, there to take a ship for Tsingtao. His army was left in the lurch-no food, no shelter, no money, and most of them a long way from home. With everything to lose and nothing to gain how can they be induced to join the army? And speaking of fighting, one of Marshall Feng's Wu's officer's did refuse to fight. He was decapitated there in the station just as Mrs. Seaton arrived. His head was placed on a spike for all to see and behold. It was pandemonium let loose in that station, and Marshall Wu's last act was a body blow to my siding with the Wu faction. It makes one think of the conditions in medieval Europe. Dear old China. This is her fifth revolution in eight years. Someday she will find a solution to the problem and settle down in peace-we all hope, soon. China did not settle down. Sun Yat Sen died in 1925, en route to Beijing to work with Chang Tso-Lin. Chiang Kai-shek began the Northern Expedition in 1926, a military campaign to consolidate the south and take Beijing. Part way through the campaign, he broke with the USSR and then began to purge the Communists. He was forced out of command, and established a regime at Nanjing. Chiang Kai-shek gained leadership of the Kuomintang in 1927, and captured Beijing in 1928. Chang Tso-lin, fleeing back to Manchuria, was assassinated by the Japanese in retribution for his continued defense of the region. Chiang Kai-shek continued to purge the Communists, and had devastated the Red Army by 1936. Chang's son, Chang Hsueh-Lin? (??? ?-2001), the "Young Marshall" of Manchuria, kidnapped Chiang Kai-shek and forced him to agree to an alliance with the Communists, to defeat the expansionist Japanese. The temporary alliance did not keep the Japanese out of Manchuria, which they invaded in 1936, but it did give the Communists enough respite to rebuild the Red Army. By 1949 Mao Zedong's troops controlled all of mainland China. Chiang Kai-shek and the Nationalists fled to Taiwan. Following the "Sian Incident" kidnapping, Chang Hseuh-lin was arrested by the Kuomintang and interned until 1991. His act is considered a heroic contribution to the Communist cause. Chang died in 2001 at the age of 100. While on the "International Train" coming down from Peking to Tientsin, I wrote down on scraps of paper what was taking place. Here is the story of our trip. 3 a.m. Sunday, Nov. 2nd. We were ready to leave Peking last Thursday when the International Train made its second trip up from Tientsin. Dr. Ferguson was consulted and said it was the most dangerous time to go, so far. If the train did not get through the fighting lines, and had to turn back, we would have given up our rooms at the Hotel des Wagons Lits. Every nook and corner of the hotel is taken because it is in the Legation Quarter, where the people are protected by treaty & by the guards of the legations. We did not go. Yesterday we heard that the train was coming up again to get the Belgian Minister who is being transferred to a new post. It would seem as tho he would have very especial protection both thro' the foreigners & the Chinese. One does not pay any fare until the end of the journey, but we had to go to the Legation for a permit to take the train. They told us they would not guarantee that we could get aboard. First-come first served. So we decided not to take any chances & we came on board soon after the train came in, at 9 p.m.
Before looking for our accommodations we found our trunks carefully piled in a corner of the baggage car. The things inside the trunks are most carefully packed. We are supposed to start at 4 a.m. It is now 3:40. There is no sleeping car on the train. In fact the cars are 2nd class without springs in the seats.The leather covering seems to be without padding. There is no heat. We can see our breath. They have given the Belgian Minister & his family a car to themselves, but it is 3rd class, with uncushioned wooden seats. His only lights are candles because the electric lights do not work in his car. The train consists of 1 American coach, 2 British, 1 Belgian, 4 for guards, a diner & baggage car. The guards are English & French. The officer in charge is French, Capt. Bertrand. The fighting is going on all along the line between here and Tientsin. There is danger of the Feng forces being driven back into Peking, which might mean that General Feng would not give himself up until the city was starved out. On the other hand Soviet Russia is established in the Legation Quarter, not as a legation like the others, but as an Embassy, taking precedence over the others-Soviet Russian that is providing General Feng with funds to carry on the war. We woke up one morning to find that the city had been captured. General Feng, with his forces left the city to defend it against the attacks of the party opposed to the government. In America we have the vote to decide which party shall govern. In China they fight & the side that wins takes over the government. Somewhere along the road Ge. Feng had a change of heart & came back, having taken sides with the party opposed to the government, which is helped financially by China's neighbors. Feng calls himself a Christian. His troops are called the people's army. That sounds Soviettish. They march thro the streets singing Chinese translations of our hymns, to the music in our hymnals. When Gen. Feng surprised & captured Peking, he announced that he should maintain order & he did. Two soldiers started to loot. Their heads are on exhibition in boxes at one of the gates as a warning. But Marshall Wu, Gen. Feng's old chief, did not stand aside to let things take their course. He said "no you don't" to Gen. Feng. He massed his soldiers and started to march on Peking from the Tientsin side. He stands for preserving g the Union, for keeping China intact. So Gen. Feng left Peking again with his troops, this time to fight his old chief, & to prevent him from getting back the city. Taking it all in all, we think it is best to get out of Peking, if possible. Mrs. Sweeney, a French woman who is en route for Cambodia, got away by automobile, using a Ford car without a top for her baggage. We decided it was too risky to go that way, with the looting that is going on in so many different places. They-Mrs. Sweeney & her party-had great difficulty in obtaining the cars, owners being unwilling to risk their cars & drivers being unwilling to risk their lives. Since then even the mail has not gotten thro by truck. 11:15 a.m. At Chan-chung, halfway between Peking & Tientsin. We have just passed 3 lines of zigzag trenches, running at right angles to the track. That means Gen. Feng's army has gone forward toward Tientsin. There are sandbags on the track. The Chinese will not remove them. They tell the train officials to remove them themselves if the want to get through. That means that the Marines must expose themselves on the firing line, now a member of them have gone ahead to do it. I have been to the front of the train to take a picture of the engine. The American officer-an engineer who officially is the only representative of our government on board-stood in front of the engine when I took the picture. He tells one that when the train moves on, one must sit low, below the windows. Right: Detail showing the American engineer who drove the train through the firing zone. Photo by Gertrude Bass Warner, Nov. 1924,. Chan-chung. PH014-42-13. The body of Col. Chin has been captured by the Feng troops & is being taken somewhere by train. Is it to get a ransom for the body, I wonder? We are moving slowly across the battlefield. Our train has been fired upon 5 times & each time made to stop. The soldiers do not understand what this train can be, whose engine is draped with the American, english, French & Japanese flags. Also, Wu wanted information about the enemy. After the 2nd & 3rd time the engine was fired upon, the Chinese engineer refused to drive the engine & our American engineer took his place. The Marshall Wu forces are being driven back onto Tientsin. I, siding with Wu, am sorry to hear it. This time it is not the firing that has stopped us. A rail had been taken out. The soldiers & passengers took hold & it was quickly replaced. I wonder if the Belgian Minister will catch his boat after all? I was asleep. Mrs. Potter called me, "Gertrude, they are firing on us with a machine gun!" It was Wu's forces this time. They mistook our train for a train of Feng's soldiers. They apologized. We have 200 guards on the train. They wanted to get off & beat the Wu men up, but were not allowed to do so. We have a good view of them in their trenches, running at right angles on either side of the track. Toward evening yesterday we arrived here, outside the city of Tientsin. Wu's forces have retreated to the suburbs of the city. The train stopped. We waited & waited. Almost all the men passengers have left their baggage on the train& walked in. With Feng so close on the heels of Wu there is an everpresent possibility of their coming this way, & as a soldier expressed it, "they would clean us up." There were six of us women who spent that second night of watchful waiting on our train, beside the family of the Belgian Minister. The guards came thro' at regular intervals thro' the night, their guns in their hands. Capt. Bertrand went into the city to try to get the tracks cleared for us. Upon his return at 2 p.m. a.m., he told me he had appealed to everybody but had not been successful. Chaplain Bronson has sent his young son into town to his mother. Mr. Bronson went up to Peking to get the boy who was at the American School outside the city. The lad is without winter clothes or overcoat. The Chaplain is staying on with us. He & I have been out to see where best to take a picture of our car. He told me that most of the people did not realize in how dangerous a position we have been. If one will go right thro' the firing line! The machine gun was in front of the engine, which is the reason why the bullets did not go thro' the cars. We saw where they had struck the engine & broken the glass. Mrs. Boyd-Carpenter & I have the stateroom. Mrs. seaton & Mrs. Potter are in a section in the open car. As we sit here in our car on the train, we not only hear the guns that are fired from Tientsin, we feel the vibration. Mrs. Seaton has started off alone on foot to see if she can get a van at the railway station to take our baggage & to try to find out if we can go directly to our steamer. The station is some mile & a half away. If we would leave the trunks behind we could all walk into town but of course I will not leave the Museum things behind with no one to look after them. Before leaving Peking we sent a telegram to the Astor House Hotel in Tientsin asking for rooms. They have sent their porter with an automobile & two assistants to look after the baggage. Leaving the train, as one passed the engine I turned to take another picture of it. There were some British soldiers nearby. I asked them to come closer so that they could be included in the picture. All the British soldiers still guarding the train came. Having taken the picture & thanked them for their faithfulness & protection we went on our way rejoicing. We c]had come the 80 miles in 31-1/2 hours. No one had been hurt. At the office of the American Express we found Mrs. Seaton. She had reached the railway station just as Marshall Wu with some 600 of his followers were leaving by train for the coast, there to take a ship for Tsingtao. His army was left in the lurch, no food, no shelter, no money & most of them are a long way from home. W@ith everything to lose & nothing to gain how can they be induced to join the army? And speaking of fighting, one of Marshall Wu's officers did refuse to fight. He was decapitated there in the station just as Mrs. Seaton arrived. His head was placed on a spike for all to gaze upon. It was pandemonium let loose, in that station, & a body blow to my siding with the Wu faction. It reminds one of midaeval [sic] Europe. Dear old China. This is the 5th revolution in eight years. May it be the last. Although Sun Yat Sen was elected president of the Republic of China in 1911, to maintain the fragmenting republic he soon ceded his position to the military leader, Yuan Shih-kai. Yuan seized broader power and in 1912 declared a new nation based in Beijing, the prelude to a new empire. Following Yuan's death in 1916, a series of warlords held Beijing. Tuan Chi-Jui ruled from 1924-26, and Chang Tso-Lin (18731928) took control in 1926. 3. The Legation Quarter: A section of the city where the foreign legations were headquartered, and thus a focal point for foreign visitors and ex-patriots. 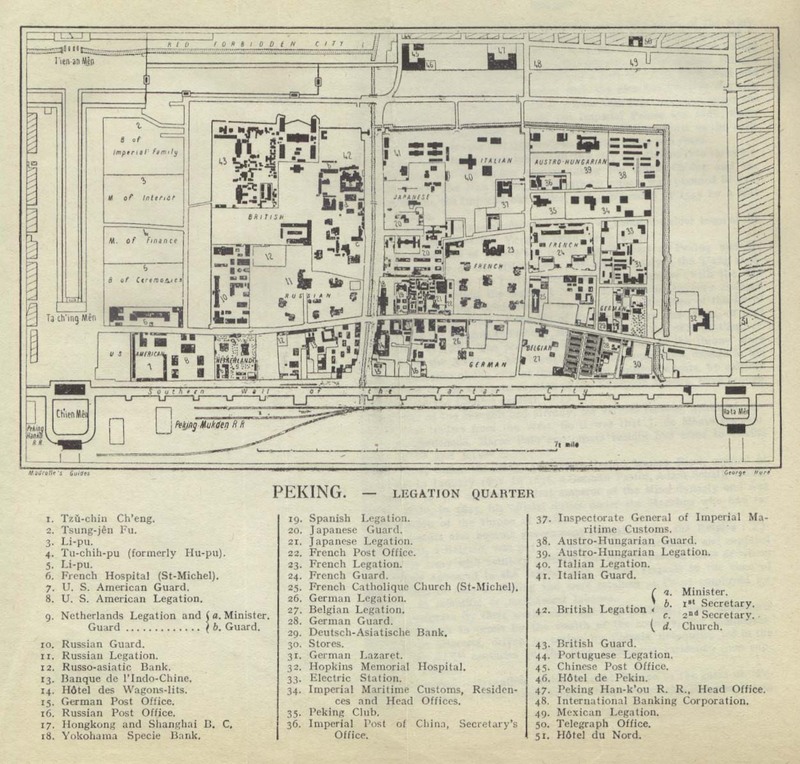 A map of the Legation Quarter of 1912 is available at http://www.lib.utexas.edu/maps/historical/peking_legation_quarter.jpg. Back. 4. Feng Yu-hsiang (18821948) was a Chinese general who became a Methodist in 1914, and was then called "The Christian General." Although charged by Wu with the defense of Peking, in October 1924 he changed sides, and seized the city on behalf of Chang Tso-Lin, who was battling Marshall Wu at the front. He joined the Nationalists in 1926, but turned against Chiang Kai-shek in 1930. Back. 5. Johan Wilhelm Normann Munthe (1864-1935) was a Norwegian who spent almost fifty years in China. He became a general in the Chinese army, and was also a noted collector of Chinese art. He supported an orphanage to which Gertrude contributed. Back. 6. Mrs. White: (??? ?-1944) The Princess Yu Der Ling was a member of the Manchu royalty, the daughter of Lord Yu Ken, and first lady in waiting to the Empress Dowager, Tzu Hsi. She wrote a book, Two Years in the Forbidden City, about her experiences at court. In 1911 she married an American, Thaddeus C. White, and later emigrated to the United States. She taught at University of California-Berkeley. Back. 7. Dr. John Calvin Ferguson (1865-1945) was a long-time friend and correspondent of Gertrude, and an old China hand. An American missionary, Ferguson went to China in 1887. He became important in the Chinese government, advising on trade and foreign relations. He served as president of Nanking University in Beijing, gave his own art collection as the foundation of a new museum for the Republic of China, and published several books on Chinese art. Ferguson acted as Gertrude's agent in Asian, purchasing and shipping items for her, and came to Eugene to consult. He published two Shanghai newspapers, the Sin Wan Pao and the Shanghai Times. Back. 8. Mrs. Lillian A. Seaton and Mrs. Emily O. Potter accompanied Gertrude from Eugene, to help acquire items for the museum. 9. The President of the Republic was Ts'ao K'un (1862-1938), a commander in the Beiyang Army who became president of the Republic of China from October 1, 1923 to November 2, 1924. Tuan Ch'i-jui (1864-1936) was president from November 24, 1924 to April 20, 1926. Back. 10. Joseph William Ballantine (b. 1888) was an officer of the U.S. Foreign Service. He was posted to Tokyo 1923-1929. Back. 11. Russian interests were indeed involved. Feng's new leader, Chang Tso-lin, was working with Sun Yat Sen. Sun was in league with Soviet Russia, used Soviet agents to help shape his political party, and sent his military leader, Chiang Kai-shek, to Russia for training. Sun welcomed the Chinese Communists into the Nationalist party. The Russians had substantial interest in Manchuria and had invested in a railroad there to open the border with China. Back. 12. Wu P'ei-fu (18741939) was a Chinese general, who fought Feng and Chang for control of Beijing. Feng was under Wu's command. Back. 13. In her speech at the opening of her museum, Gertrude enumerated some of the items she guarded on the train: "During this time I obtained the Emperor's dinner set in blue and white. Blue is half mourning in China and the Emperor had used this set while in mourning for his father. I also was able to get a rare Ox-blood plate and some blue and white ginger jars which are of the much appreciated shade of dark blue, some jewelry such as was used by the court ladies several hundred years ago, and some old paintings." Oregana, 1934, p162. Back.